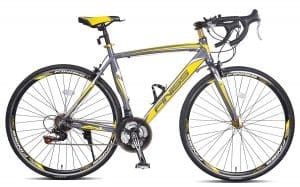 If you are looking for a first bike to purchase, a road bike is definitely the way to go! This is the most popular from all the types of bikes that are available, especially for recreational users! You can use it to bike on your way to school or work! The good news is that you do not have to spend a lot to have a high-quality road bike. 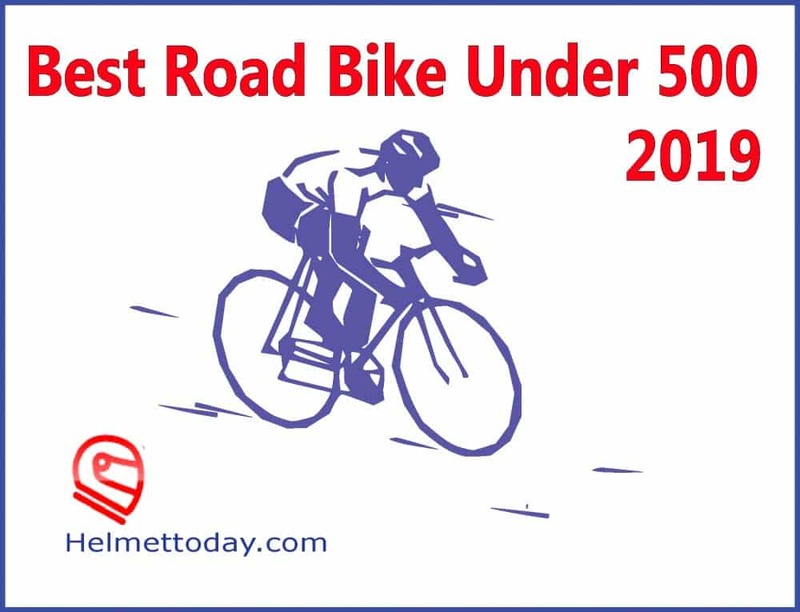 If you need help to decide what to pick for the best road bike under 500, read on and we’ll let you know some of the best products that should be on your radar. Ready to start your journey in finding the perfect road bike? Below are some of the brands and models that will provide the best bang for the buck. If you are looking for an entry level road bike, this is one product that should be on your radar. It may not be the best in terms of its build quality, but with its price, it is pretty much decent and will make an acceptable choice for beginners. The average weight of the bike is 28 pounds, which is pretty much lightweight for most users. This means that it won’t require too much effort to use. The reliability of the bike is second to none, which you can attribute to the fact that it uses components from Shimano. For instance, it has Shimano TZ-31 front derailleur, Shimano RD-TZ50 rear derailleur, and Shimano SA050 shifters. It also has an aerodynamic frame, which is one more thing that makes it better. This is an excellent alternative to most bikes with a cylindrical frame. The frame is flat and will have a positive impact on your speed. Nonetheless, given its price point, you have to expect that it is not at par to those in the higher-end of the market. For instance, there are some complaints with regards to how some parts are made of plastic that does not seem durable. The hub can also make a noticeable noise. The chain quality can also be better. A stylish ride with an economical price – this is exactly what you can expect from this product. While it is easy on the wallet, it has an abundance of features to make sure that the performance will be hard to match. The bike features 21 speeds, which you can adjust with the premium Shimano shifters. To add, the bike comes with a lightweight aluminum frame that makes it easy to move around. You do not have to exert too much effort to cruise at a high speed. When it is time for an upgrade, there is no need to worry. A lot of its components are easy to modify once you are ready to take your biking to the next level. The bike comes in three different sizes – 50, 54, and 58 centimeters. Make sure to choose one that is appropriate for your weight and size. It is also a good thing that it comes with a water bottle holder, making it easy to keep you hydrated while on the road. Upon purchase, the package is already inclusive of free pedals. Lightweight and sturdy – these are two of the things that you can expect in this product. One of the reasons for this is the aluminum frame. It is able to keep the weight at a minimum, yet you can be confident that it won’t compromise durability in any way. The installation of the bike is not too much work for anyone, especially for beginners. Right out of the box, you do not have to sweat that much. It has quick-release front wheels that will be a breeze to assemble. The latter will also make it convenient to pack and store. At its price, the performance is quite impressive, although far from those that are above the 500-dollar mark. It has 700c tires that will tread well in almost any type of surface, even when you are cruising on rough terrain. Meanwhile, with the variable speed, you will enjoy the versatility of this road bike. The design of the handlebar makes it quick and easy to change the speed as you desire. Lastly, you will also love it when it comes to aesthetics. There are five colors that are available. It also has a design that is sure to turn heads while on the road. As you search for the best road bike under 500, this is another model that should be on your watch. It is available in three different sizes. The smallest is ideal for those who are up to 5 feet and 8 inches in height. The largest, on the other hand, is ideal for up to 6 feet and 5 inches. 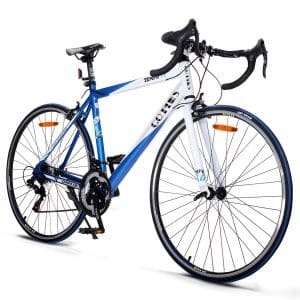 For an enjoyable and comfortable ride, you can also be confident that this road bike will not disappoint. One of the reasons for this is the stem without threads and the handlebars made of alloy. It has an ergonomic construction to minimize fatigue, especially if you use it for a long time. The frame and fork, meanwhile, are made of stainless steel. This is a bit heavier as against to those that are made of aluminum. Despite this, it is still easy to move it around. Plus, steel is also known as a material that easily withstands the test of time. Despite being an impressive road bike, however, it is still far from those that you can find in the higher end of the market. There are some components that are quite flimsy and can give you quite a headache, such as the chains. 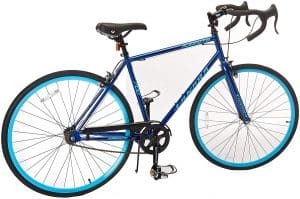 This is another entry-level bike with a price that is sure to not hurt the wallet but with a quality that you will find to be decent enough. Among others, one of the best things about this road bike is the double disc brake. The latter will lock and stop in an instant, making it a great feature to ensure your highest level of safety. The stopping power is way better than what you can find from the conventional V-brake systems. The use of the top-of-the-line components is one more thing that makes it impressive. Despite the economical parts, most of the parts have premium construction, especially the Shimano shifter and derailleurs. Nowadays, it is quite hard to find these components at an affordable price. When you receive the bike, it is already 85% assembled. It comes with thorough instructions from the manufacturer to let you know what exactly needs to be done to complete the assembly. If there is one thing that makes this different from the other road bikes mentioned in this short guide, it would be the fact that it only has a single speed. The fixed speed can be a limitation for some riders. 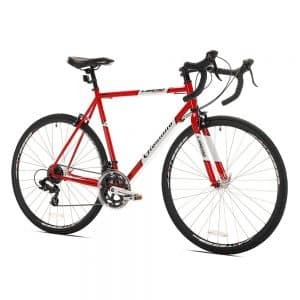 Despite the single speed, it has exceptional features, especially given its price. For instance, it has alloy wheels, which will provide you with a smooth ride. This makes it an excellent choice when it comes to comfort. It rolls easily and has great traction on different surfaces. A lot of its users were also happy with how quick it is for the bike to pick up your pace. You will be in complete control as you dictate the speed of the bike. You will easily notice how responsive the bike is. The design of the brakes is also great. To be specific, it has front and rear alloy side pull brakes. The stopping power will not disappoint, which should be enough to provide you with peace of mind. Aero Bike: These bikes are built for speed. They have wheels with deep section and large tubes. Endurance Bike: They have a relaxed geometry, which is great for upright and comfortable riding position. 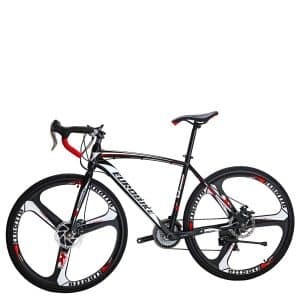 Lightweight Bike: It will be an excellent choice for those who want to ride a road bike at some elevation. Gravel Bike: This is a type of road bike that will be impressive even when you are riding on rough terrain. Touring Bikes: They are generally heavier when compared to other road bikes. It is also known for providing a high level of comfort to its users. What Makes a Road Bike Different? When searching for the best bike, there will be an endless list of choices. Among others, a road bike is one of the best. But, how exactly is it different from the other types, such as a mountain bike? From the name itself, you will already have an idea of what it is. Basically, it is a bike that is meant to be used on a paved road. It has impressive maneuverability and speed without the need to exert reasonable effort on the end of the user. They are light and agile. Another distinct characteristic of a road bike is the presence of thinner tires. Generally, most of them have tires that are 23, 25, or 28 millimeters in width. Also, typically, the road bikes do not offer suspension. This is because they are meant for surfaces that are smooth and flat, so most manufacturers do not see the need to include a suspension system. The exact opposite of a road bike is a mountain bike. The latter is made for tougher applications. You can use it even for biking downhill. As a responsible buyer, you have to look beyond the price. With that, this section briefly outlines some of the most important considerations that will help you to come up with the right choice. This is one of the most important parts of the bike and will also be indicative of the overall geometry. 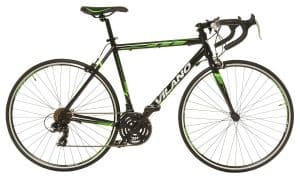 From the design to the material, make sure that the road bike comes with an impressive frame.The most popular frame material is aluminum, which is known for being cheap and lightweight. Steel is also common, which is heavier. For the premium options, most of them have a carbon fiber frame, which has excellent ability to absorb vibration. The wheels of the bike are important because of their influence on its overall weight, comfort, performance, speed, and aerodynamics, among others. Choose wheels that are made of the right materials and suitable for the size of the bike. If you have the money, you can upgrade the wheels to suit your needs. Pay attention as well to the features that will have an effect on your comfort. For instance, the seat should be wide enough. It should also be soft, making it able to minimize fatigue when you are out biking. The wheels must be able to absorb vibration so that your body won’t be able to feel much of the impact. Choosing the right size is another critical consideration when choosing the best road bike. It must be able to fit you like a glove, which will make sure that every ride will be safe and comfortable. Refer to the bike fit chart, which the manufacturer will provide. Often, the right size of the bike will depend on your height.If you are 5 feet and 1 inch to 5 feet and 3 inches, a bike frame size of 48 centimeters will be enough. For taller users who are up to 6 feet and 5 inches in height, on the other hand, the best bike frame size is 62 centimeters. Going to the technical side, you will have to decide on the better type of brakes for a road bike. The old ones usually come with a caliper brake, which is the traditional choice. Basically, there are blocks of rubbers that are squeezing into the rim.For the more modern bikes, on the other hand, the brakes are often rim or disc. Disc brakes have better stopping power, although they are common in mountain bikes. Rim brakes, on the other hand, are common in road bikes. In sum, a road bike does not need to be crazy expensive to deliver quality and performance that will be hard to match. As shown above, even with less than $500, you will have a decent selection of premium products that are sure to deliver the highest level of satisfaction.